Friday 10 July saw the culmination of the Teach Through Music programme – a year of professional development, inspiration and support for London’s Key Stage 3 music teachers, funded by the Department for Education and the Mayor of London. 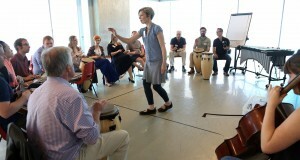 Trinity Laban Conservatoire of Music and Dance hosted a jam-packed day that celebrated all the achievements of the teachers enrolled on the programme through the series of Inspire Events and Short Courses held throughout the year. Secondary school music teachers, freelance music educators, academics and cultural organisations all came together to share research findings, connect with the pan-London community of practice established over the year, and – most importantly – make music. Keynote speech: François Matarasso – writer, researcher and speaker. …as well as a host of talks, presentations and networking opportunities! The day drew to a close with some live jazz provided by Trinity Laban musicians, and celebratory cool drinks on the canal side. Many thanks to all those who attended and helped make the event such a huge success! You can find a Storify summary made up of Tweets and photos here to re-live the day. Watch this space for resources and materials from our presenters.